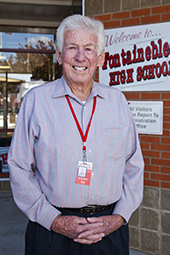 On November 17, 2014, at age 79, Bill Donaldson broke his own record, for the 7th consecutive year, of substitute teaching days at Fontainebleau High School in Mandeville. As Fontainebleau’s Substitute Teacher of the Year, Bill is now on target to complete 151 days of substitute teaching this academic year. All the more impressive when you know that there are a total of 170 teaching days in the year. For a man who allegedly retired a decade earlier, you’d be hard-pressed to find many full-time employees with a work ethic as strong as Bill Donaldson’s. Rejoining the workforce after retirement is not uncommon nowadays. Some people work to cover unanticipated expenses. Others miss certain things like social interaction or being involved in something larger than themselves. But Bill’s motivation to substitute teach was different. He teaches to make a positive difference in the lives of his students – sharing the lessons he has learned through life in the hope that his students will optimize their own opportunities for success. Through years of life experience in business, marketing and sales, Bill interacted with thousands of very different people in countless situations. When every interaction is vital to your career, you pay special attention to how people communicate – what they say and, frequently, what they don’t say. Life experience gives us tools to understand people by identifying certain characteristics in their behavior. More importantly, we can learn how to modify our own behaviors to maximize our chance of success. Life experience has given Bill important tools for success – tools he’s eager to share. Substitute teaching is not just a job for Bill. It’s something he looks forward to each day, because for every day he teaches, he gets another chance to share his invaluable knowledge and guide his students toward a brighter future. Bill Donaldson … Peoples Health Champion.